Our range of products include continuous bag sealing machine, 25 kg bag sealing machine, heavy duty bag sealing machine, hot and band sealer, paddle operated hot sealing machine and 5 to 50 kg bag sealing machine. We Sigma Instrumentation are dealing in Heavy duty Continuous Bag Sealing Machine ( capacity 5-10 kg ) for P.P. Bags. Client also invited for his specially require of bag sealing machine. We Sigma Automation are reckoned as eminent manufacturers, suppliers, and exporters of premium array of Heavy Duty Bag Sealing Machines including High Volume Bag Sealing Machines that are designed to handle high volumes of sealing applications with remarkable efficiency and speed. These are made by using the finest grades of high gauge metal alloys and other components. These machines can be availed at reasonable rates by our clients. The Vertical Heavy Duty Bag Sealing Machines made available by Sigma Automation are fabricated under the strict surveillance of our qualified engineers team. These technologically advanced machines are used for sealing of 10 kg to 50 kg bag. 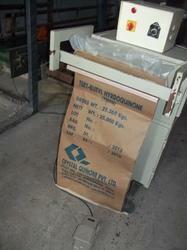 In our range, temperature set point is maintained according to the conveyors speed and thickness of (material ) bag. Furthermore, customers can avail these machines from us, by paying via variegated simple modes as per their choice. Ideal for Hot and Band Sealer of laminated or non laminate pre made pouches. Suitable for on line operation with filling machines and for mass production. This machine is used for sealing various pre-made pouches and it is a best sealing equipment to be widely used in pharmaceuticals, chemical industries, dairy, cosmetic, food & groceries, seed processing units, automobile spare parts, electronic spare and online and offline packaging. 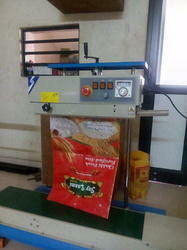 We are leading manufacturing of heavy duty 10 kg to 20 kg continus bag sealing machine as per clientrequire. 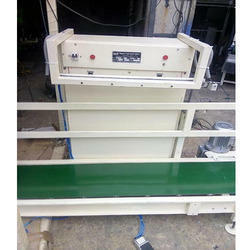 Also we are mfg of Pnumatic hot sealing machine. this user friendly machine helps the operator to adjust the heavier bags as the operation is done with the help of the foot. it has tiltable sealing jaws and an adjustable bag rest is provided for operator's comfort. it also has an adjustable electronic timer and audio-visual sealing indicators. 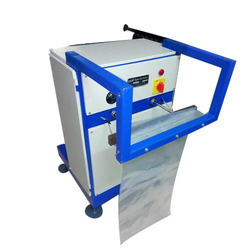 additional features of hot bar sealers and code bar sealers especially for the multi layer laminated bags can also be provided as per your requirement. almost all the multi layer laminated bags of aluminium/ paper/ polythylene/ polyurethane lamination can be sealed with the hot bar sealers.